I read about “forest bathing” or shinrin-yoku a few years ago and my immediate thought was, “What a great way to describe time in the mountain forests.” If you aren’t familiar with the concept, you might think it is rooted in some ancient Japanese practice of spending time in forests for improved health. It’s actually a campaign started in 1982 by the Forest Agency of Japan to promote a healthier lifestyle. 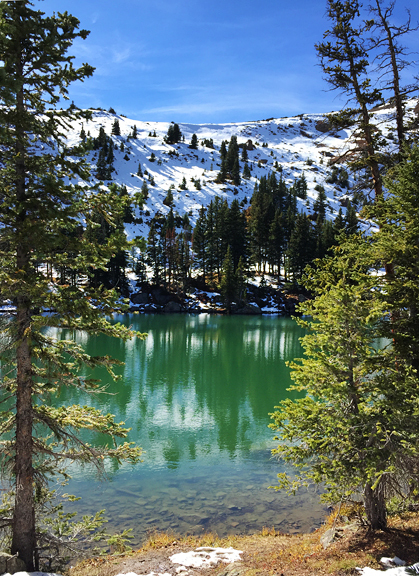 But I really like the concept because I find my heart, head, and body feel better with time spent in the forests (and mountains – which are partly covered in forests). It’s how I coped with my sister’s death, my cancer treatments. It’s where I go when I need healing. 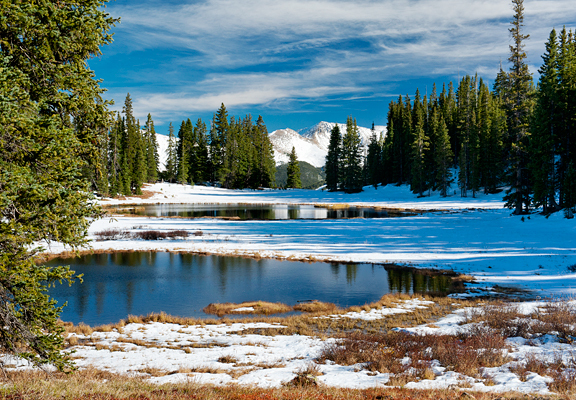 Last Monday we received our first substantial snowfall of the year in the mountains. Locally we got close to a foot of new snow and some of my favorite ski mountains in Colorado were reporting nearly two feet. There’s a feeling that comes over you when that first snow storm hits for the season. 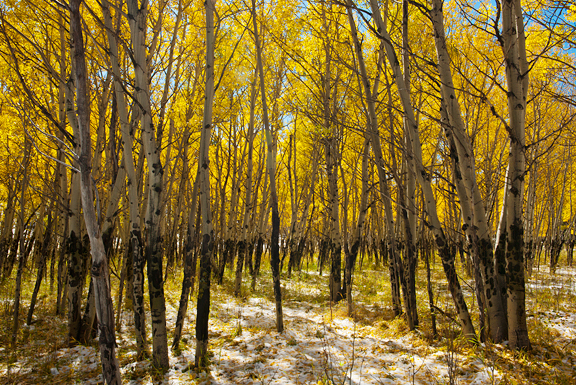 After all of the sunshine and glowing yellow aspen leaves and mild autumn days, the world suddenly turns cold and white and you want to curl up in a warm blanket. I get that feeling for all of two seconds and then I’m running downstairs to get my ski gear out of the basement. Jeremy would probably have been bundled in all of his warm clothes, sipping hot coffee, and working on his laptop for days if I hadn’t shoved him out the door with me. Every season he needs reminding that he loves winter – because he really does. It was a short-lived storm and by mid-week we were back to sunshine and pleasant temperatures. This is the Colorado way. Every season the weather has these “surprise” swings and each time it happens, people on the flats flip out because they have unreasonable expectations and a poor understanding of statistics and physics. You learn to go with the flow in the mountains. One day you’re skiing fresh snow and the next you’re trail running through an amphitheater of gold. 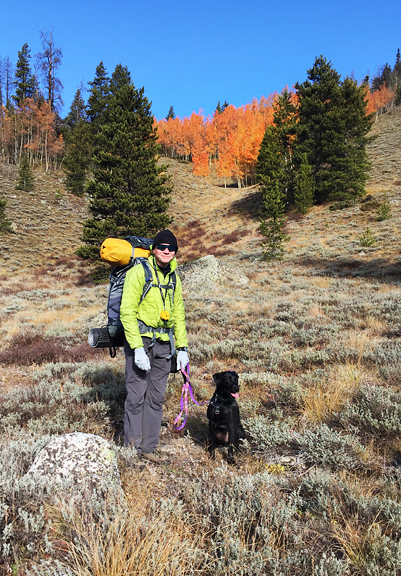 As the weekend approached, Jeremy and I made plans for a short backpacking trip with Neva. She had been doing so well with her training that we thought we should squeeze an overnight in before we would be on skis for six months. 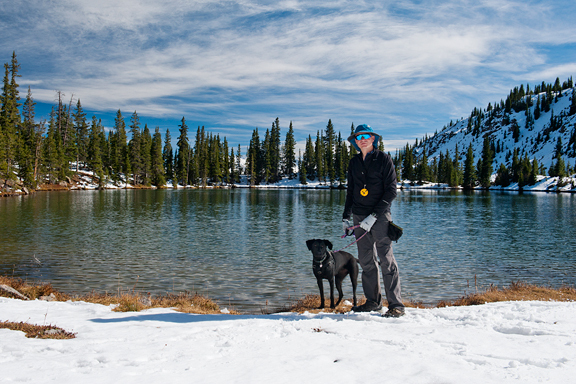 We originally planned to take her up to a local lake, but when the overnight wind forecast was for 50 mph gusts, snow, and temperatures below freezing, we postponed by a day. I have a love-hate relationship with the Front Range. Part of the reason I hate the Front Range is the wind. Oh wait, that IS the reason. We pulled out trail maps, looked up trail information, searched Google Maps, and read weather forecasts until we found a trip that could work. 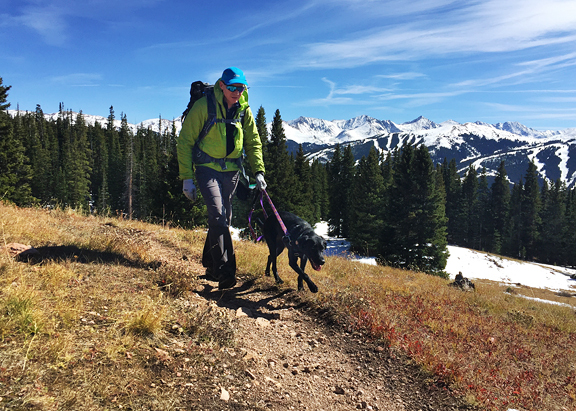 We had always wanted to explore the Gore Range, but never got around to it because wrangling Neva made backpacking a miserable experience. Now we were hoping for some improvement. Silly us, we didn’t make the connection that double digit snow totals at the ski resort across the valley would mean snow on the trails less than a week later. We should have known, but we’re out of practice. 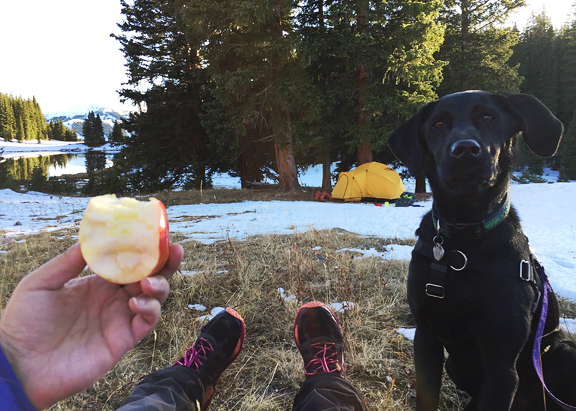 Despite snow and ice covering more than half the trail, we enjoyed clear skies, mild winds, beautiful views, and a good dog! 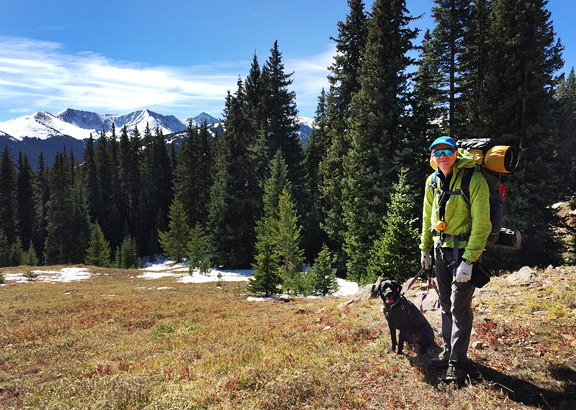 Neva had a blast and I think this means we can look forward to more backcountry exploration with her next summer – something we all love to do. Of course, when you spend a good bit of the last six months walking the woods and looking for mushrooms and berries, it’s a hard habit to break. There were zero mushrooms, because it was too cold and late in the season at that elevation, but we DID find a section of huckleberry patches that were still loaded with huge berries. They were tired looking, having been through a freeze and thaw cycle several times already. Some were beginning to shrivel, almost all of them fell off the plant when you so much as looked at them, and they tasted so complex and sweet – like the grapes they use to make ice wine. We ate a handful and I picked some for Neva to taste, at which point she began to eat them off the plants. On our drive home from the trailhead, Jeremy and I couldn’t help but note all of the lodgepole forests that looked like prime candidates for matsutake mushrooms next year. 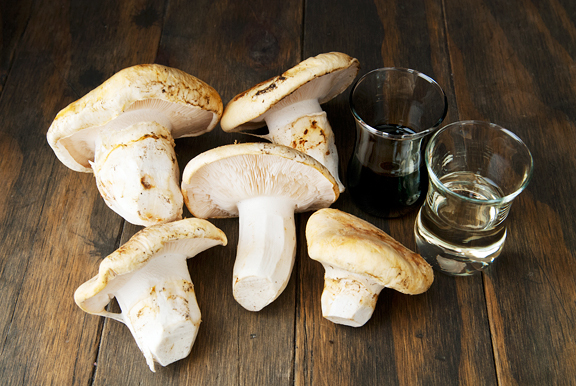 If you will recall, matsutake means “pine mushroom” in Japanese. If you can find them fresh, grilling is a super simple and delicious way to prepare them. If not, you could try a different fleshy fresh mushroom. But the special pine-cinnamon flavor of a grilled matsutake is probably the only way you can taste the embodiment of a camping trip in the pine forest. 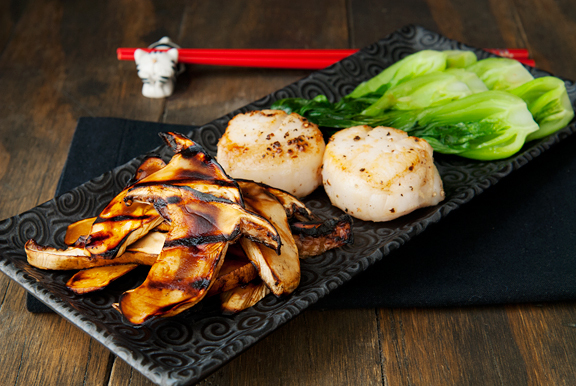 To make the recipe gluten-free, substitute tamari for the soy sauce. I tried to marinate the mushrooms in a shallow bowl, but it didn’t work too well and it was annoying. So In recommend pouring the marinade into a ziploc bag. 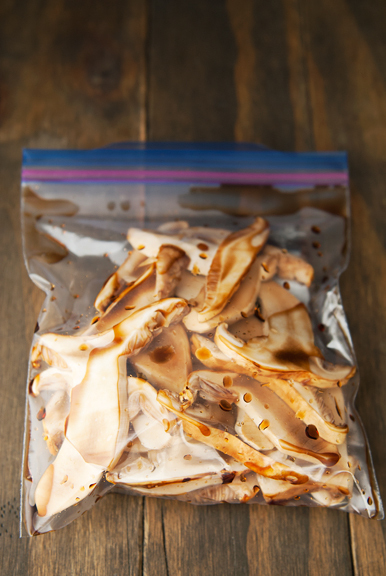 The ziploc method is much better and will also marinate the mushrooms slices more evenly. I left the slices in for 20 minutes, flipping the bag once or twice. The slices grilled over medium-high flame for about 4-5 minutes a side. 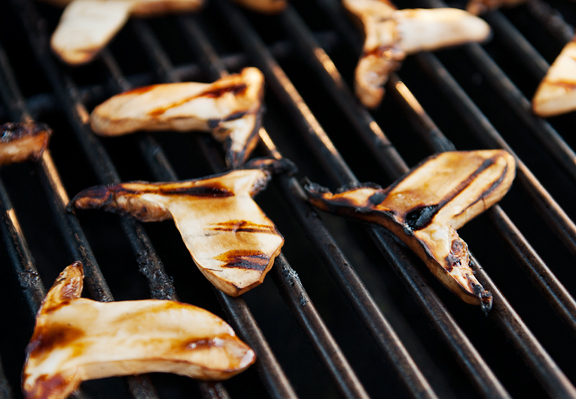 How long you grill the slices depends on how thick you sliced the mushrooms, but you can tell when the edges just begin to char and the slices become pliable that they are done. The original recipe roasts the mushrooms in the oven, but I liked the idea of grilling and adding a smokey component. These are firm, meaty umami bites that are particularly well-matched with seafood. And if you can’t get out for a little forest bathing, eating grilled matsutake is like the next best thing. 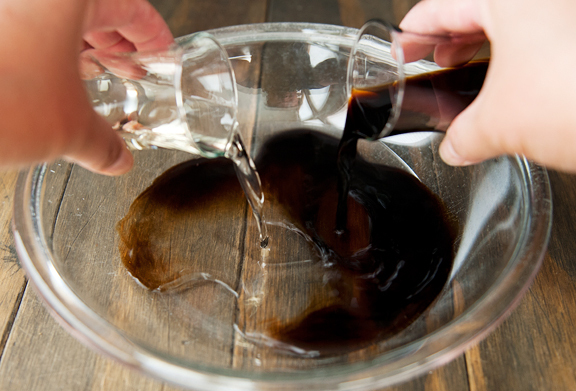 Combine the soy sauce and mirin in a ziploc bag. 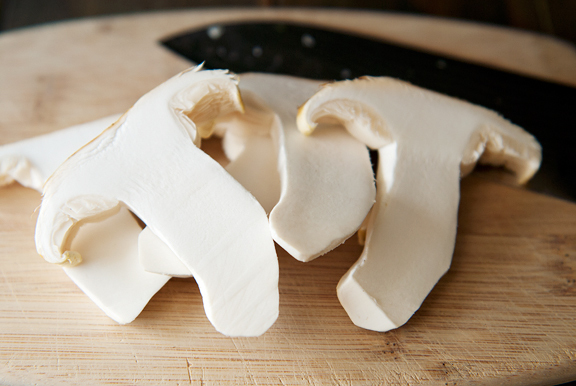 Cut the mushrooms into 1/4- to 1/2-inch thick slices. 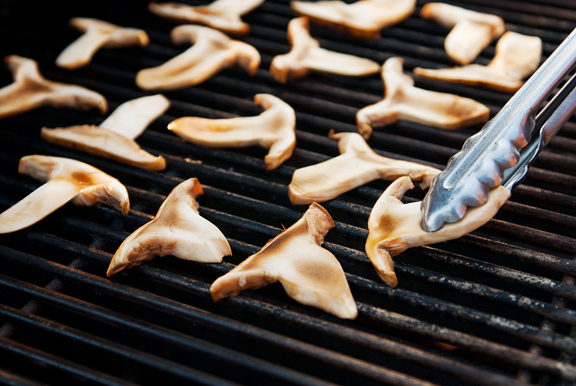 Place mushroom slices in the bag with the marinade. Squeeze out any excess air from the bag and seal. Shake to spread the liquid around the mushrooms. Marinate for 20 minutes. Heat grill to medium-high. Grill 4-5 minutes each side until the edges are browned. Serves 2-4.
definitely interpreted “forest bathing” literally upon first read, but aside from that, your definition makes so much more sense, and i can just feel that sense of calm that only nature can provide. and these mushrooms look so fantastically charred and dark! 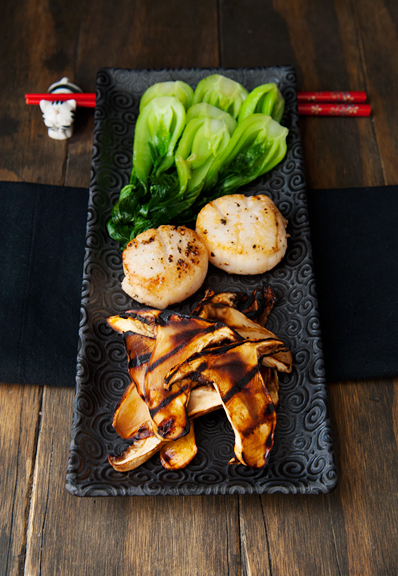 Mushrooms and scallops! Two of my all time favorites together. Love your back country photos. For our mom/daughter trip this year, my mom chose Denver, as she’d never seen the boy’s campus. She suggested October, as my husband and I had been traveling in September, and had also just been to Denver to drop Alex off. I told her I thought we should stick to September, and she was glad when I sent her DU’s first snow day video yesterday. So, does it usually just take one shove to make Jeremy remember that he loves winter? How beautiful and the recipe doesn’t look bad either… looks like you may have a little competition next year w/the huckleberries and Neva! lol! 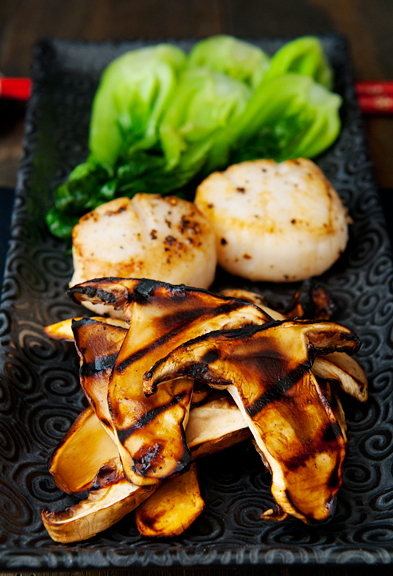 I love the simplicity of the grilled mushrooms and the scallops together. Scallops I can get my hands on right now (I’m literally on an Island, looking at the SE Atlantic Ocean as I type this), but the mushrooms will be harder to source… beautiful post and photos, thanks Jen. Forest bathing. I like that. Funny, but what you said abut Jeremy, having to remind/convince him every year that he loves winter… that’s me with the woods. With forest bathing. Once I get out there and hike and camp and hunt, I remember the things about it that I love and the peace it brings to my constantly full, loud, 100 mph brain. But sometimes Steve has to force me. I don’t know why that is. 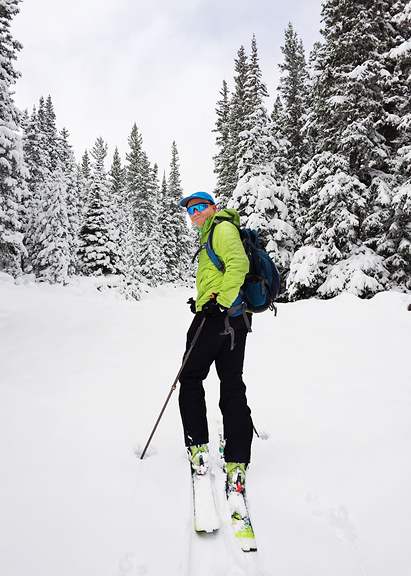 Kristin – Tell your mom that the great thing about Colorado is that you can get several inches in the metro area one day and sunshine will wipe it all out the next! And yes, Jeremy needs only one shove to remember ;) But he needs that shove! ha ha ha! Jill – Ha! We don’t let Neva into our sleeping bags. They are too expensive to take her long nails (yes, she still won’t let us clip them – next project…) and they are probably too warm for her. She liked the down quilt just fine.